Irvin Victor Macklin was born in Fenella, Ontario in 1888. He earned a Bachelor of Arts at Victoria College, University of Toronto. Advised by his doctor to “get out into the country” after his graduation in 1910, Mr. Macklin moved west and traveled the Long Trail into the Peace Country that summer. He filed on a homestead east of the hamlet of Grande Prairie on which he would reside until his death 70 years later. I. V. Macklin has the distinction of being the first school teacher in Grande Prairie. When no qualified teacher could be found for the Grande Prairie School District No. 2357 organized in 1911, Mr. Macklin agreed to fill in temporarily. Classes started in January 1913 and he taught until June 30 of that year. In 1912, Mr. Macklin married Nellie Cass, from Montreal. By 1914, he was an established dairyman in the area and active in the community as a leader in church affairs as well as in agriculture, economics and politics. He became the first magistrate in Grande Prairie in 1914. 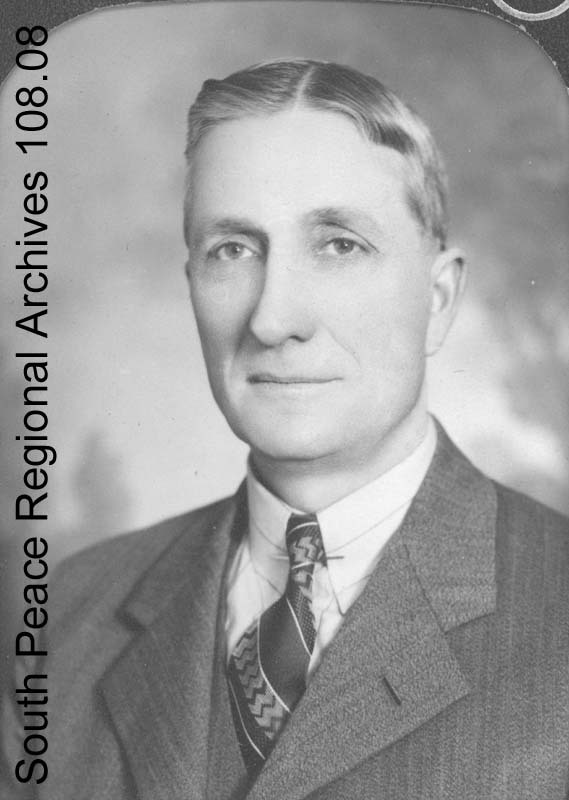 He served as a director for the Peace River country in the United Farmers Association movement and instigated the Debt Adjustment Act during the Depression. For three federal elections, he was the candidate for the CCF (Co-operative Commonwealth Federation) Party in the Peace River constituency. He was also a well-known radio speaker and writer for the CCF. His articles appeared in papers across Canada, as well as in the Grande Prairie Herald-Tribune. The Macklins had two children, Velma and Victor. Nellie Macklin died in the spring of 1940 and in 1941 Mr. Macklin married Matilda Jantz from Crooked Creek. Four children were born to this second marriage: Irvin, Arthur, Ann, and Linda. Mr. Macklin passed away in 1980, having lived in the community of Grande Prairie for almost all of his adult life. The Macklin farm was redeveloped as residential lots: the Hillside area at the beginning of World War II, Mountview Estates around 1970, and Ivy Lake Estates around 1980.